NEWINGTON - The Newington football team knew the end of the season was going to be difficult, especially facing perennial powerhouses such as No. 12 Middletown, Maloney, No. 10 East Hartford and Wethersfield. Last Friday against the Blue Dragons, Newington head coach Jason Pace made it very clear that if his team played scared or intimidated, they would not have success. Newington was shut out 42-0 against Middletown. Aside from its poor play, the Indians were without starting quarterback Nick Pestrichello due to a concussion from a game against Bristol Central in Week 7. Healthy and ready to go, the sophomore will take the field with his team tonight. Hopefully the Indians have learned from their mistakes, because Maloney is the next team on the list. 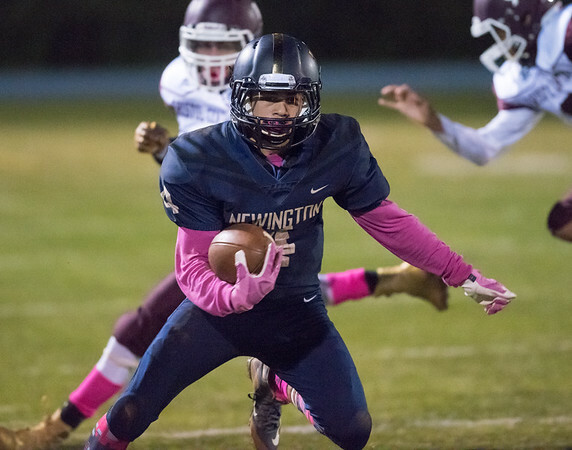 Newington will travel to Falcon Field in Meriden for a 6:30 p.m. kickoff. The Spartans have a 6-1 record, with their only blemish being a 29-22 loss to Bristol Central, a team the Indians hung with until the very end. Maloney has a number of key players to rely on, including senior signal caller Elliot Good. Throughout the season he has connected with wide receivers Victor Marquez and Maurice Brackett for a majority of the team’s scores. During the Spartans’ most recent 51-16 win over Farmington, Good tied a program record with five touchdown passes, four of them to Marquez, while the defense forced six turnovers. Despite the records, Newington believes if it comes out firing, it will be able to play a close game with the Spartans. But it is one thing to say it and another to do it. The Indians have now suffered two shutout losses on their season record, against Platt and Middletown, and Pace does not want it to happen again. Posted in New Britain Herald, Newington on Wednesday, 31 October 2018 21:25. Updated: Thursday, 1 November 2018 13:40.